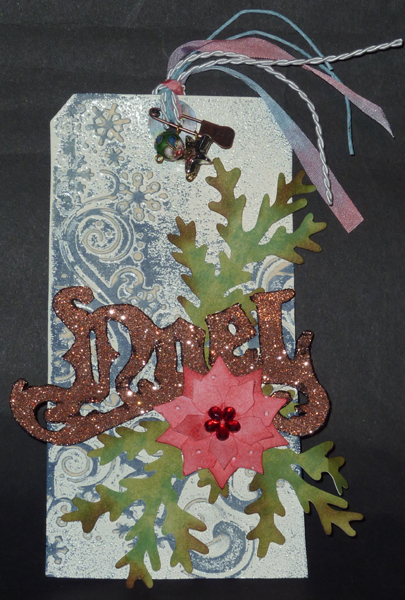 I used a manilla tag cut with Tim's tag die. Direct to paper with Chipped Sapphire then sponged Blue Jeans, dried thoroughly. Inked the negative side of the embossing folder (Cuttlebug snowflake folder from set #2000220) with Perfect Medium, ran my tag through my machine and embossed with white embossing powder. Die cut the "Noel" from white cardstock covered with Sookwang tape, sprinkled with Stampendous "Copper" ultra fine glitter. Burnished well and edged the word with a black Sharpie marker. Sponged various greens onto a piece of white cardstock. Found some leaf shapes and cut with my electronic cutter. Edged them with some "Gathered Twigs". arranged everything and adhered to tag. 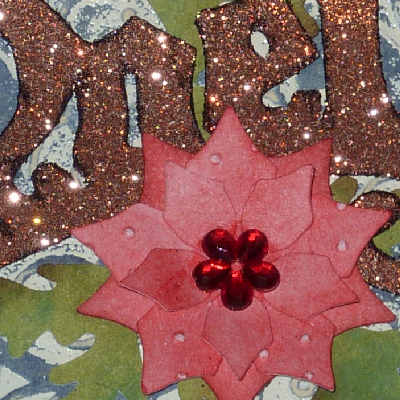 Die cut the smallest florets from the Spellbinders Poinsettia die. Sponged "Festive Berry" and "Aged Mahogany around the edges. Embossed the middle floret with a Cuttlebug Swiss Dots folder and colored the dots with a white gel pen. Adhered to tag and added the red rhinestone flower center. Colored a piece of silk ribbon with Distress Stains (red and blue) and tied it along with some string and twisted ribbon. attached a star charm and a glass bead with a trinket pin. Gorgeous! Love your variations of the tag. Lovin' the color of the Noel! Thanks so much for playing along with Inspiration Emporium! Very impressive. Love the idea of doing a tag. Thanks for joining us at Fairy Fun Fridays. Wow! Your BG is beautiful and the embellishments really make it even more so! Love the Noel and Poinsettia too! this really is a wonderful tag and so appropriate for Tim's miracle works! Thank you for joining us at Digi Doodle Shop's Best challenge this week. thanks so much for joining us at TPC...and good luck..! 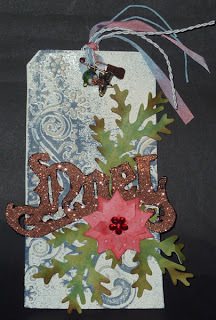 I love tags and this is stunning, those sparkly letters really top it off beautifully, thanks for joining the fairies at Prairie Fairy Fridays and good luck!